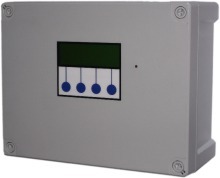 The 3P RainForce TH series commercial rainwater controller performs all the functions you would expect of a commercial system such as adjustable pressure, duty standby/assist and BMS output. Pressure control is achieved by modulation of the pumps which are run as required to maintain pressure within a specified range, avoiding the loss of efficiency associated with variable speed systems when running at low demand. This control panel may be installed within a 3P Technik commercial rainwater harvesting unit, but is also a compatible replacement or upgrade for several rainwater harvesting units manufactured by others. Pump control is provided via direct mains voltage outputs from the control panel, operating as necessary to maintain an optimum pressure range (adjustable). Duty standby and duty assist are supported. Pumps may be run either in alternation, or with 1 active and 1 redundant spare. Faulty pumps are automatically retired. There is no requirement for pumps to be matched, or for any specific model to be used in conjunction with this Controller so long as they meet the minimum required pressure. Automatic pumps may also be used if the additional security of dry run protection is desired, although pump cut in/out function will be taken over by the RainForce Controller. Mains water backup is provided by a top-up solenoid, filling a break tank situated locally to the control system. The break tank is either used exclusively for mains water, with a motorized valve switching the pump inlet between rainwater supply and break tank supply, or it may be a combined mains and rainwater break tank, supplied with water both by a mains water solenoid and an in-tank supply pump within the main rainwater harvesting tank.